With summer just around the corner thoughts at Crush HQ are turning to our favourite holiday destinations and after a quick straw poll Italy is definitely in our top 3! From North to South Italy is rammed full of art, culture, history and most importantly epic food and wine so we thought now would be a good time to get ourselves into the mood and crack open some Italian favourites to get us into the holiday spirit. Without a doubt one of the most exciting destinations in Italy for wine production, as well as its sheer beauty, is the southern Italian island of Sicily. Once the home to mass produced, bulk wine which fed the European ‘wine lake’ and gave rise to cheap ‘plonk’ has now transformed into a region regarded as producing some of the most diverse, innovative and exciting wines throughout the whole of Italy. The beauty of its renaissance, quite literally turning itself around and pushing back at the critics, is that unlike its more formidable sister regions of Tuscany, Piedmont and the Veneto it has not become ensconced in fame for one particular ‘style’ of wine. Yes it has its flagships of Nero d’Avola and Grillo but no particular ‘wine’ it is synonymous with. More than this it benefits for its position in the Mediterranean which gives it a climate, at times, more akin Africa than Italy and an incredible diversity in soil type. It is all of these things that have enabled the growers and winemakers to experiment and refine to start showcasing to the world what can be produced from this little island and the quality it commands. Our buyers were so impressed a few years ago by the almost complete ‘U’ turn of the winemaking community on Sicily that they knew something special needed to be created and Santa Lucia was born. When searching for inspiration we were told about Santa Lucia, or Saint Lucy, who was born in Sicily at a time when it was extremely dangerous to be a Christian in Italy. Denounced for her faith by a suitor she had to refuse to marry, she was martyred and venerated across Italy for her devotion. Her relics now reside in a church in the Veneto region. Our tribute to her is a range of wines that includes Sicilian native varietals such as Nerello Mascalese and Venetian classics like Pinot Grigio. 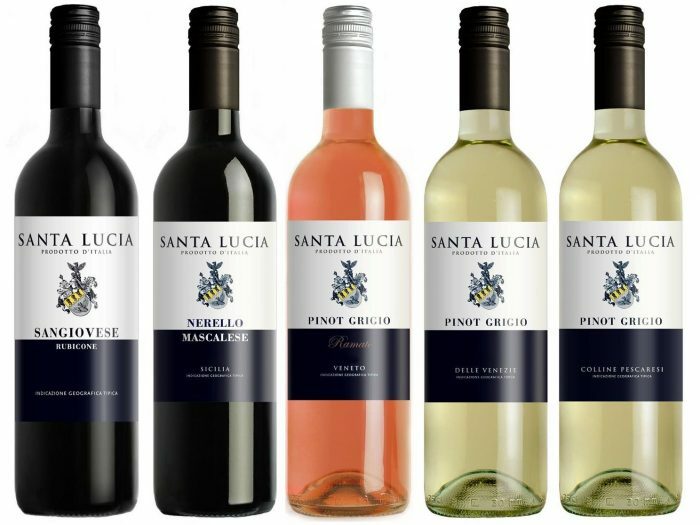 The Santa Lucia range incorporates some of the best grape varieties being grown in Italy today, grown in specific vineyard sites where each varietal is encouraged to reach its full potential.We couldn’t think of a more fitting name for our brand of wines whose whole premise is about moving away from the norm and expected, taking indigenous Italian varietals but blending with a more modern winemaking approach producing a wine to be enjoyed and drunk by anyone from novice to wine connoisseur. So while we count down the days to our summer holiday we’ll be opening one or two of the Santa Lucia wines to help inspire us!